Below is a DRAFT text of the homily. It may vary considerably from the recorded version. Please excuse typos and grammatical errors, and do not cite without permission. The recording was made during an online Morning Prayer service which we had instead of Eucharist because of a snow storm. At Epiphany the magi come offering gifts. The order is important, and I want to talk about gifts, but I don’t want to gloss over paying homage. Think back a couple of weeks to the story of the Magi. They see the star and come to Jerusalem. Ask Herod where they can find this child…so that they can pay him homage. And they go to Bethlehem and find Jesus and his mother…they are filled with overwhelming joy. They first pay him homage. Then they offer gifts. Today when we “pay homage” to someone we are usually honoring them with a kind of public ceremony (at retirement, or after their death). Or when we creatively copy a more famous artist’s work. “it’s not stealing, it’s an homage.” But the verb really refers to the act of swearing loyalty to a feudal lord. Giving ones self over completely as a vassal. At its root it probably refer to the act of a dog licking its master’s hand…when I come home and my dog rolls over on her back so I can pet her stomach…that’s homage…it’s an act of total submission…completely giving yourself over to another. We are the gifts (along with the bread and wine) given in homage to Christ…and then we come to the altar with our hands outstretched and empty, and receive…a gift…a gift that we are to take out into the world. We give ourselves and we receive our selves. Our beloved… true selves that we are to take back out into the world. It is through this weekly and eternal exchange of gifts that God’s love is made manifest…is made real and tangible in the world. By bringing our gifts here and giving them completely over to God, and taking the gifts we receive here out into the world and sharing them with others. 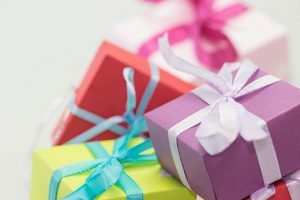 What’s really important is that the gifts we are…the gifts we receive…are not to be hoarded, or used for personal gain, they are for the common good. So what are your gifts? What gifts do you bring here? What gifts do you take out into the world? How are you using them for the common good? Or to put it another way: How does God, Christ, the Holy Spirit manifest in you? When you are out and about in the world…what in you leaps when you catch sight of the Divine? What activates in you when the clouds part for a second and you see others “shining like the sun.” What gifts of the Spirit do you have access to…can you share? Here and out in the world? You might be sitting there thinking, “I don’t have any idea.” How do you know what your spiritual gifts are? I wish discerning spiritual gifts was an easy process…but it’s not. Discerning spiritual gifts is a little trying to figure out where all that good wine came from? It’s confusing at first….Sort of like figuring out any kind of natural ability it takes a some trial and error. It takes some courage…some good humor…and some honest self reflection. And it’s very easy to confuse what I want to be true with what really is possible. I know about six chords on the guitar, and I sometimes enjoy bashing out a simple tune…and yes, if I practiced every day I would get better (growth mindset), but even after I put in my 10,000 hours of practice, I’m still not going to be a very good guitarist…I simply don’t have the physical dexterity. So if I set my heart on a career playing in a rock and roll band, I’m going to be frustrated and disappointed. Sometimes what you want to do…and what you’re actually gifted at doing are not the same thing. Sometimes you may not want the gift that has been given to you, or you may not know how to use it. But doing the work to figure out what your gifts really are…and then being able to use them…that feels really good. Figuring out spiritual gifts usually means doing some uncomfortable, but honest self-reflection (but that’s what Lent is for). For right now, I invite you to spend some time thinking and praying about what gifts you might have to offer here and in the world? What gifts emerge from the abundance of your belovedness? And is there anyone here whom you might share that reflection with? Who might be willing to help you discern what those gifts are?